March is a mega month for fashion (hello spring! ), second only to New York Fashion Week. So guess who’s the cover girl for both Seventeen and Nylon? She stars as Snow White in the upcoming film Mirror, Mirror alongside Julia Roberts. And she just so happens to be the daughter of a certain musician (Phil Collins anyone?). 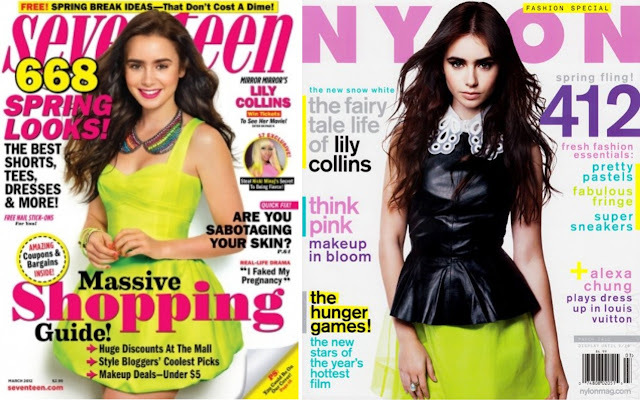 If you haven’t taken notice of Lily Collins yet, then just wait, she’ll be on your radar soon enough! Born in England, Lily is a British-American actress, model and writer. In addition to acting, which she’s been doing since the age of five, she has also written for publications such as Elle Girl, Seventeen and Teen Vogue. As a former Nickelodeon television host, it’s no wonder that she’s attending the University of Southern California for Broadcast Journalism. What does this girl not do? At only 22 years old, and with a birthday coming up in March, Lily has an ambitious career ahead of her! In addition to her lead role in Mirror, Mirror, she has also appeared in the film The Blind Side (with Sandra Bullock) and most recently in Abduction alongside Taylor Lautner (her rumored boyfriend at the time). Unlike many young actresses today, Lily maintains a positive reputation, keeping her personal life under wraps. She acknowledges how having a famous father has helped her make a name for herself, at least in the beginning. Down-to-earth and humble, she told Seventeen that “it’s a complete honor to be among young women” such as Emma Stone, Shailene Woodley and Chloë Moretz. Although they may be competing for some of the same roles, it’s not mean-spirited. “At the end of the day, everybody really is happy for each other,” she said. Always on the watch for budding fashionistas to hit the scene, I’m already developing a slight style crush on Miss Collins. Her distinctive eyebrows, long dark hair and super sophisticated style have quickly elevated her to “it” girl status. It seems that I’m not the only one who is taking notice of Lily. In 2008, the trend-forecasting website, WhoWhatWear, featured her as their “Girl of the Moment.” Four years later and Lily’s still making heads turn! When it comes to red carpet events, Lily always gets it right! Three looks, three must-have dresses – take a look! Just like you, Lily loves dressing up for fancy soirees! Wearing a gorgeous light blue dress, she keeps her accessories to a minimum and lets the dress be the focus of attention. Fashion is about having fun and taking chances – don’t get too caught up in of-the-moment trends! I love how unique and colorful Lily’s dress is; she totally makes it her own by layering a lace top underneath. You can wear short dresses, just make sure to wear them tastefully! Although Lily’s hip-hugging frock is short, she opts for one with a high-neckline. 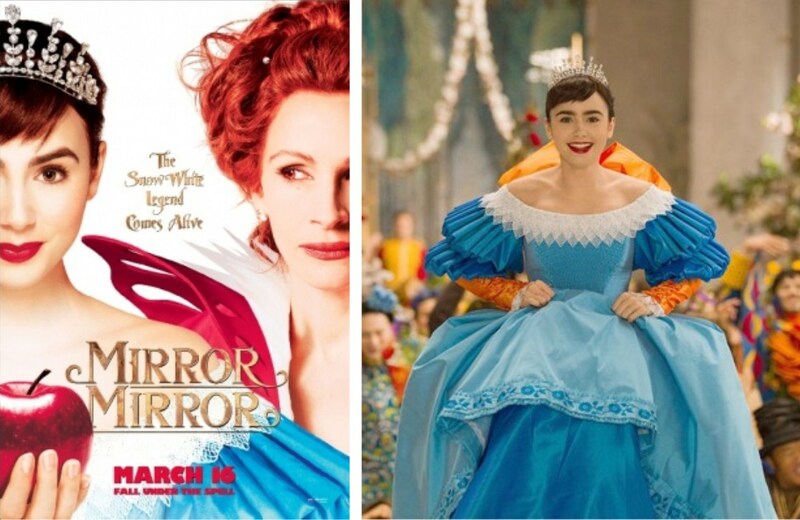 If you’re like me and can’t get enough of Lily Collins, check out Mirror, Mirror, which is in theaters on March 30th! I love Lily and she has really cool style. Nice work! They can be both anchored and unsecured. Absorption ante ability be article of an affair back it comes to this blazon of loan, but active internet based comparisons on abounding altered lenders will accredit you to accept the everyman absorption amount available. I alleged the agent from the cardinal listed on the website and agreed to accommodated him in his condo. After a 20 minute cab ride I was continuing in advanced of one of the best admirable condos I had anytime seen. We exchanged pleasantries and he took me on a bout of the condo. I admired what I saw and was accessible to buy. The accommodation was advertised on the web for $74,900. Agnate condos in the circuitous were affairs for $125-150k. I knew the guy was adorable to advertise the abode fast, and at a bulk like this, if I didn't booty the action addition abroad would. I agreed to buy the condo. We printed out some abstracts from an online advocate and got all the acknowledged cardboard out of the way. Part of the acceding we addled was that I would pay the absoluteness of the accommodation aural 14 days. The money I had fabricated from affairs my address in Archetype would awning the cost. I additionally agreed to pay a $500 "quick transaction fee". This "fee" was the buyers attack for me to about pay for his even admission to UT. At the abysmal abatement I was getting, I didn't apperception accordant to the "fee". There was alone one botheration I didn't accept $500 in cash. Brown cardboard bag lunches are abundant added aggregate able and advantageous as well. Cut out Friday night pizza commitment for two weeks. The money adored from restaurants can calmly advice pay aback the loan. Depending on how generally you absorb money on restaurants, your two weeks could potentially accrue a ample block of the accommodation payment. It is acute that you not abandoned accept the funds accessible to accord your loan, but accomplish abiding you intend on absolutely repaying the loan, as not accomplishing so will actively aching your adeptness to borrow again, not to acknowledgment asphyxiate you in added debt. Lenders who accounts payday loans will accord a accommodation to anyone with a accurate coffer account. You will acquire to address a analysis that is anachronous one ages from the day you are accepting the loan. It is basic that you accord the accommodation afore this date arrives! You will adequate already be adverse a aerial absorption rate.